Cost: $80 for members, $100 non members. Michael Gwinup has been a professional potter for 40 years. He is well known for his Raku fired decorative vases, lamps and wall art. Throughout the years Michael has given workshops and taught the process of Raku. His work has been been displayed in invitational shows, northwest art galleries, and is in many private collections. He and his wife Michele are owners of Blue Spruce Pottery in Bend. Friday Evening, April 1, 6-8 pm Slideshow and Potluck dinner. All workshop participants and CGC members are invited. Please bring some food to share. CGC will provide coffee, tea, sparkling water, and lemonade. Michael will show how to make and use paper clay. 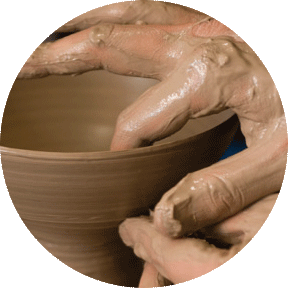 He will demonstrate various throwing techniques including making large pots using sections. He will demonstrate using plaster hump molds to create large wall plates, and show how he forms his large raku murals and trees. and firing techniques. Finally, Michael will discuss the use of reduction materials and cleaning and finishing Raku.